본 발명은 무선통신 시스템에서의 페이징 정보의 송수신 방법 및 장치를 제안한다. The invention proposes a transmission method and apparatus of the paging information in a wireless communication system. 확장성 대역폭에 기반한 무선통신 시스템에서는 시스템과 단말이 다양한 대역폭을 가지는 것이 가능한데, 본 발명은 시스템 대역폭에 비하여 낮은 대역폭 수신 능력을 가진 단말이 시스템에 접속하여 페이징 정보를 획득할 수 있는 방법을 제공한다. In wireless communication systems based on scalable bandwidth, it is possible the system and the terminal having a different bandwidth, the present invention is connected to the terminal, the system having a low bandwidth receiving capability than the system bandwidth, and provides a way to obtain the paging information, . 본 발명이 제안하는 방법을 통해 페이징 정보 전송의 오버헤드를 줄이고 단말기의 수신 복잡도를 줄이는 효과를 얻을 수 있다. Through the method of the present invention offer advantages it can be obtained to reduce the overhead of the paging information transmitted to reduce the complexity of the receiving terminal. 본 발명은 무선통신 시스템의 페이징 정보 송수신 방법 및 장치에 대한 것으로서, 구체적으로 확장성 대역폭(scalable bandwidth)을 지원하는 셀룰러 기반의 시스템에서의 페이징 정보의 송수신 방법에 관한 것이다. The present invention relates to a method of transmitting and receiving paging information in a cellular-based system that supports, in particular the bandwidth scalable (scalable bandwidth) as for the paging information transmission and reception method and apparatus in a wireless communication system. UMTS(Universal Mobile Telecommunication Service) 시스템은, 유럽식 이동통신 시스템인 GSM(Global System for Mobile Communications)과 GPRS(General Packet Radio Services)를 기반으로 하고 광대역 부호분할 다중접속(Wideband Code Division Multiple Access, 이하 'WCDMA'라 한다)을 사용하는 제3 세대 비동기 이동통신 시스템이다. UMTS (Universal Mobile Telecommunication Service) systems, European mobile communication system, a GSM-based (Global System for Mobile Communications) and GPRS (General Packet Radio Services) and wideband code division multiple access (Wideband Code Division Multiple Access, hereinafter 'WCDMA "referred to) is a third-generation asynchronous mobile communication system using the. 현재 UMTS 표준화를 담당하고 있는 3GPP(3rd Generation Partnership Project)에서는 UMTS 시스템의 차세대 이동통신시스템으로 LTE(Long Term Evolution)에 대한 논의가 진행 중이다. (3rd Generation Partnership Project) 3GPP UMTS standards currently in charge of the discussions underway on the LTE (Long Term Evolution) as the next generation mobile communication system of the UMTS system. LTE는 2010년 정도를 상용화 목표로 해서, 100 Mbps 정도의 고속 패킷 기반 통신을 구현하는 기술이다. LTE is the degree to in 2010 to commercialize goal is to implement the technology of approximately 100 Mbps high-speed packet based communication. LTE 시스템의 무선 접속 기술로는 고속데이터 전송에 유용한 주파수 분할 다중(Orthogonal Frequency Division Multiplexing, 이하 'OFDM'이라 한다) 방식을 활발히 논의하고 있다. A radio access technology of the LTE system has been actively discussed (hereinafter referred to as 'OFDM' Orthogonal Frequency Division Multiplexing,) useful frequency division multiple high-speed data transmission system. OFDM 방식은 다수개의 서브 캐리어들간의 직교성(Orthogonality)을 유지하여 전송함으로써 고속 데이터 전송시 최적의 전송 효율을 얻을 수 있는 특징을 가지며, 주파수 스펙트럼을 중첩하여 사용하므로 주파수 사용 효율이 좋고 다중 경로 페이딩(multi-path fading)에 강한 특성이 있어 고속 데이터 전송시 최적의 전송 효율을 얻을 수 있다는 특징을 가진다. OFDM system has a feature that can achieve optimal transmission efficiency during high-speed data transmission by transmitting to maintain orthogonality (Orthogonality) among the plurality of sub-carriers, because it uses the overlapped frequency spectrum good frequency use efficiency multipath fading ( it is robust to multi-path fading) has a characteristic that can achieve optimal transmission efficiency during high-speed data transmission. 고속 데이터 서비스를 제공하기 위한 OFDM 기반 셀룰러 무선통신 시스템에서 중요한 특징 중의 하나는 확장성 대역폭(scalable bandwidth)의 지원이다. An important feature of OFDM based cellular wireless communication system for providing high speed data service is supported in the bandwidth scalable (scalable bandwidth). 확장성 대역폭에 기반한 시스템은 예를 들어 20/15/10/5/2.5/1.25 MHz 등의 다양한 주파수 대역폭을 가지는 것이 가능하다. Systems based on scalable bandwidth is possible example having a different frequency bandwidth, such as 20/15/10/5 / 2.5 / 1.25 MHz, for example. 서비스 사업자들은 각 셀 별로 상기 대역폭 중에서 하나를 선택하여 서비스를 제공할 수 있으며, 단말도 최대 20 MHz 대역폭까지의 서비스가 가능한 것에서부터 최소 1.25 MHz 대역폭만을 지원하는 것 등 여러 종류의 단말이 존재할 수 있다. Service providers may provide the services to select one of the bandwidth for each cell, the terminal may also be present is a wide range of terminals, such as to support the minimum 1.25 MHz bandwidth, from a service on up to 20 MHz bandwidth available . 상기 확장성 대역폭 기반 시스템 하에서, 처음 시스템에 접속하는 단말은 시스템 대역폭에 대한 정보가 없는 상태에서 셀 탐색(cell search)에 성공해야 한다. The terminal to be connected to under the scalable bandwidth based systems, the first system in the absence of information about the system bandwidth to be successful in a cell search (cell search). 단말은 상기 셀 탐색을 통하여 데이터 및 제어 정보의 복조를 위한 송신기와 수신기 간의 동기(synchronization) 및 셀 ID를 획득한다. The UE acquires synchronization (synchronization), and a cell ID between the transmitter and the receiver for demodulation of data and control information through the cell search. 상기 시스템 대역폭은 동기채널(Synchronization Channel, 이하 'SCH'라 한다) 신호로부터 상기 셀 탐색 과정에서 얻거나 셀 탐색 후에 시스템 정보 전송 공통제어채널인 방송채널(Broadcasting Channel, 이하 'BCH'라 한다) 신호의 복조를 통하여 얻을 수 있다. The system bandwidth is a synchronization channel (Synchronization Channel, hereinafter 'SCH' quot;) obtained from the cell search process of the from the signal or after a cell search system information transmitted common control channel is a broadcast channel (Broadcasting Channel, hereinafter 'BCH' quot;) signal It can be obtained through the demodulation. 상기 BCH는 단말이 접속하는 셀의 시스템 정보를 전송하는 채널로서 단말이 셀 탐색을 끝내면 가장 먼저 복조하게 되는 채널이다. The BCH is a channel and demodulates the first mobile station finishes the cell search as a channel for transmitting system information of the cell with which the terminal is connected. 단말은 상기 SCH 신호를 통하여 셀 탐색을 수행하며, 각 셀 별로 성공적인 셀 탐색 후 상기 BCH 신호를 수신함으로써 상기 셀에 대한 시스템 정보들을 얻게 된다. The terminal obtains the system information of the cell by receiving the BCH signal after a successful cell search for each cell, and performs cell search through the SCH signal. 단말은 상기 BCH 신호를 읽어냄으로써 각 셀 별로 셀 ID, 시스템 대역폭, 채널 설정 정보 등 데이터 채널 및 기타 제어 채널의 신호들을 수신하는 데 필요한 시스템 정보를 얻는다. The UE obtains system information needed to receive signals of a data channel and other control channels, and each cell for each cell ID, system bandwidth, channel setup information by reading the BCH signal. 셀룰러 무선통신 시스템에서 유휴 상태(idle state)에 있는 단말(User Equipment: UE)을 시스템이 호출하여 연결(connection)을 만들고자 할 때 PCH(Paging Channel)를 운용한다. Terminal in an idle state (idle state) in a cellular radio communication system: The system is called a (User Equipment UE) will be running a PCH (Paging Channel) When you want to create a connection (connection). 단말은 상기 PCH 신호 내에 자신을 호출하는 정보가 있으면 시스템과 연결을 설정하는 과정을 시작하게 된다. If the terminal is information that calls itself within the PCH signal it will begin the process of establishing a connection with the system. 상기 PCH 신호는 페이징 지시자(Paging Indicator, 이하 'PI'라고 한다)와 페이징 메시지(Paging message)로 구성될 수 있다. The PCH signal may be of a paging indicator (Paging Indicator is called, hereinafter 'PI') and the paging message (Paging message). PI는 시스템이 호출하고자 하는 단말이 속한 그룹을 지시하는 그룹 ID와 페이징 메시지가 어떤 무선자원을 통해 전송되는지를 알려주는 스케쥴링 정보로 구성된다. PI is composed of the scheduling information indicating whether the transmission system through the group ID and the paging message to any terminal to indicate the group that the wireless resources to the call. 상기 그룹 ID는 복수 개의 단말 ID를 대표하는 ID이다. The group ID is an ID that represents the plurality of the terminal ID. 페이징 메시지는 상기 PI가 알려주는 그룹 내에서 시스템이 호출하고자 하는 단말의 ID와, 어떤 목적으로 호출이 발생했는지 등의 정보로 구성된다. Paging message is composed of information such that the ID and a call for any purpose of the terminal to generate a call to the system in which the PI is tell group. 유휴 상태의 단말은 전력 소모를 줄이기 위하여 일정 주기마다 깨어나서 기지국으로부터의 송신정보를 확인하게 되는데, 이를 DRX(Discontinuous Reception)라고 한다. There is in the idle state the MS to determine the transmitted information from the base station wakes up every predetermined cycle in order to reduce the power consumption, it is called a DRX (Discontinuous Reception). 즉, 유휴 상태의 단말이 상기 DRX 주기마다 유휴 상태에서 깨어나서 PCH 신호를 수신하고 상기 PI 내의 그룹 ID를 확인한다. That is, the idle MS receives the PCH signal wakes up from an idle state for each of the DRX cycle, and check the group ID in the PI. 상기 PI 내의 그룹 ID가 자신의 그룹 ID와 같을 경우에는 페이징 메시지를 확인하며, 상기 PI 내의 그룹 ID가 자신의 그룹 ID와 다를 경우에는 다음 DRX 주기가 될 때까지 유휴 상태를 유지한다. If the group ID in the same PI and his group ID, check the paging message, and the group ID in the PI different from the own ID, the group maintains an idle state until the next DRX cycle. 단말이 상기 페이징 메시지를 확인하여 페이징 메시지에 포함된 단말의 ID가 자신의 ID와 같을 경우, 시스템이 어떤 목적으로 자신을 호출했는지를 확인한 후 시스템 호출에 대응하는 수신 동작을 수행한다. If the terminal ID of the UE included in the paging message to check the paging message equal to the own ID, and performs a reception operation corresponding to the system call, after checking whether the system call itself for any purpose. 만약 상기 페이징 메시지에 자신의 ID가 포함되어 있지 않은 경우, 단말은 다음 DRX 주기가 될 때까지 유휴 상태를 유지한다. If that is not the paging message contains the own ID, the terminal maintains the idle state until the next DRX cycle. 상기와 같은 페이징 절차 및 DRX 동작을 통하여 단말은 불필요한 전력 소모를 줄이게 된다. Through a paging procedure and a DRX operation, such as the terminal is reduced unnecessary power consumption. 확장성 대역폭을 지원하는 시스템이 기존 시스템과 다른 주된 특징 중 하나는 시스템 내에 서로 상이한 대역폭 지원 능력을 가지는 다양한 단말들이 존재한다는 것이다. The system that supports bandwidth scalability, one of other major features with existing systems is that there are various terminals having different capability from each other in the system bandwidth. 그러므로 상기 확장성 대역폭을 지원하는 시스템에서 PCH를 운용함에 있어서 중요한 과제 중 하나는, 시스템 대역폭보다 작은 대역폭을 가진 단말이 시스템 대역의 일부 대역에서 서비스를 받고 있을 때에도 PCH 신호를 원활히 수신할 수 있도록 하는 것이다. Therefore, one of the major challenges in as operating the PCH in a system supporting the above scalable bandwidth, which allows to receive the PCH signal smoothly even when the terminal has a smaller bandwidth than the system bandwidth is to be served in some band of the system band will be. 도 1은 20MHz 전체 시스템 대역 내에 10 MHz 및 20 MHz 수신 대역폭의 유휴 상태의 단말이 할당된 예를 도시한 것이다. Figure 1 illustrates an example of the idle state of the received 10 MHz and 20 MHz in the whole system band 20MHz bandwidth, the terminal is assigned. 도 1을 참조하면, 20MHz 대역폭을 가지는 시스템에는 최소 수신 대역폭이 10 MHz인 단말들 UE1(100), UE2(102), UE3(104)과 20MHz인 단말 UE4(106)이 공존한다. 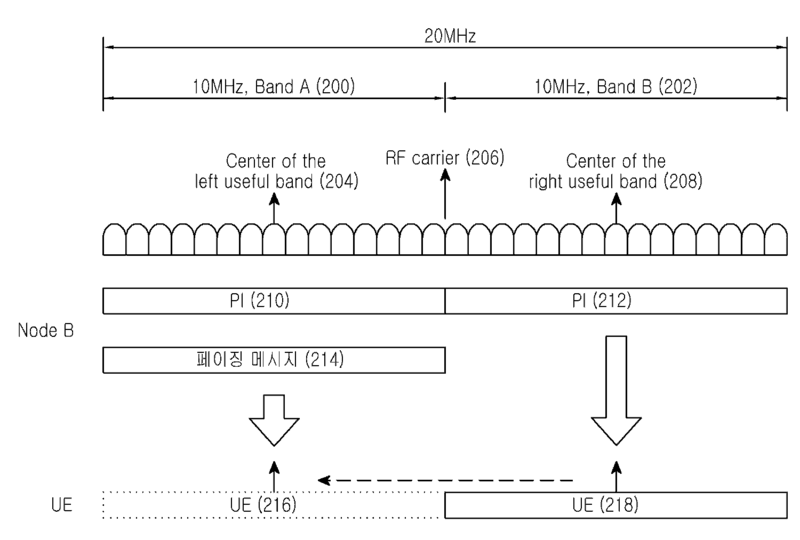 Referring to Figure 1, there coexist a minimum reception bandwidth of 10 MHz of the terminal UE1 (100), UE2 (102), UE3 (104) and the 20MHz terminal UE4 (106) system having a 20MHz bandwidth. 이 경우 PCH 신호를 20MHz 시스템 대역 전체에 걸쳐 흩트려 전송하는 경우(방법 1)와 각각의 10MHz 대역에 PCH 신호를 흩트려 전송하는 경우(방법 2)를 생각할 수 있다. In this case, it is conceivable a case in which the PCH signal scattered fend transmitted over the 20MHz system bandwidth (Method 1) and the case of transmitting the PCH fend scatter signal to each of the 10MHz bandwidth (method 2). 10MHz의 최소 수신 대역폭을 가지는 UE1(100)의 경우에, 방법 1은 PCH 신호가 20MHz 대역 전체에 걸쳐 전송되어 UE1(100)의 수신가능 대역을 초과하므로 이 방법은 UE1(100)에게 적용할 수 없다. In the case of UE1 (100) having a minimum reception bandwidth of 10MHz, Method 1, so PCH signal is transmitted over the entire 20MHz bandwidth exceeds the receivable band of the UE1 (100) The method can be applied to the UE1 (100) none. UE1(100)은 중심 RF(Radio Frequency) 주파수(116)가 좌측 10MHz 대역에 맞춰져 있으므로, 이 대역으로 전송되는 PCH2 신호(110)를 수신할 수 있다. UE1 (100) may be a central RF (Radio Frequency) frequency 116, so the left side set to 10MHz band, receiving PCH2 signal 110 that is sent to the band. 마찬가지로 중심 RF 주파수(118)가 우측 10MHz 대역에 맞춰져 있는 UE2(102)는, 이 대역으로 전송되는 PCH3 신호(112)를 수신할 수 있다. Similarly, UE2 (102) with the center RF frequency (118) set to the right 10MHz band can receive the PCH3 signal 112 that is sent to the band. 따라서 상기 시스템이 UE1(100)과 UE2(102)를 동시에 지원하기 위해서는 PCH2 신호(110)와 PCH3 신호(112)를 각각의 10MHz 대역에서 중복해서 전송해야 하는 오버헤드가 발생한다. Therefore, the overhead of the system is to be sent redundantly UE1 (100) and UE2 in order to support 102 at the same time PCH2 signal 110 and PCH3 signal 112 from each of the 10MHz bandwidth. 중심 RF 주파수가 상기 20MHz의 중심(114)에 맞춰져 있는 UE3(104)의 입장에서는, 상기 방법 1은 UE3(104)의 수신 가능대역을 벗어나므로 적용불가하고, 방법 2에 의해 PCH2(110) 또는 PCH3(112)를 수신하더라도 일부 대역만 수신 가능하므로 올바른 페이징 절차를 수행하기 어렵다. Center the position of the UE3 (104) the RF frequency set to the center 114 of the 20MHz, the method 1 is not applied is beyond the receivable band of the UE3 (104) and, PCH2 (110) by the method 2, or even receiving PCH3 (112) capable of receiving only part of the band, so it is difficult to perform a correct paging procedure. 20MHz의 최소 수신 대역폭을 가지는 UE4(106)는, 상기 방법 1 또는 방법 2를 사용해서 전송되는 PCH 신호가 모두 UE4(106)의 수신 가능 대역을 벗어나지 않으므로 수신 가능하다. UE4 (106) having a minimum reception bandwidth of 20MHz can be received, so departing from the receivable band of the all UE4 (106) PCH signal to be transmitted by using the Method 1 or Method 2. 그러므로 확장성 대역폭을 지원하는 시스템에서 20MHz의 시스템 대역폭보다 작은 대역폭을 가진 단말이 시스템 대역의 일부 대역에서 서비스를 받고 있을 때 PCH 신호의 수신을 원활히 할 수 있는 방법이 필요하다. Therefore, a way to facilitate the reception of the PCH signal is required when the terminal has a smaller bandwidth than the system bandwidth of 20MHz in a system that supports bandwidth scalability receiving services in some bands of the system bandwidth. 본 발명이 이루고자 하는 기술적 과제는 시스템 대역폭 및 단말 대역폭의 확장성을 지원하는 시스템에서 단말이 페이징 정보를 원활히 수신할 수 있도록 하는 PCH 신호의 송수신 방법 및 장치를 제공하는 것이다. The present invention is to provide a transmission and reception method and apparatus of the PCH signal to terminal receives facilitate the paging information in a system supporting scalability of the system bandwidth and UE bandwidth. 본 발명의 실시예에 따르면, 시스템 대역폭이 단말의 최소 수신 대역폭의 정수배인 무선통신시스템에서 상기 단말에게 페이징 정보를 전송하는 방법에 있어서, 상기 시스템 대역을 상기 단말의 최소 수신 대역폭과 동일한 크기의 주파수 대역들로 구분하는 과정과, 상기 주파수 대역들 각각을 통하여, 상기 페이징 정보 중 상기 시스템이 호출하고자 하는 단말의 그룹 아이디를 포함하는 페이징 지시자를 전송하는 과정과, 상기 복수의 주파수 대역들 중 하나의 주파수 대역으로 상기 시스템이 호출하고자 하는 단말의 아이디를 포함하는 페이징 메시지를 전송하는 과정을 포함한다. According to an embodiment of the invention, the system bandwidth is a method for transmitting paging information to the UE from the minimum reception bandwidth integer multiple of the radio communication system of the terminal, the frequency of the same size for the system band and the minimum reception bandwidth of the mobile station throughout the process, and each of the frequency bands separated by the band, and transmitting a paging indicator including a group ID of a terminal to be called is the system of the paging information and, in one of said plurality of frequency bands a frequency band comprises the step of transmitting a paging message including an ID of the terminal to call the system. 또한 본 발명의 실시예에 따르면, 시스템 대역폭이 단말의 최소 수신 대역폭의 정수배인 무선통신시스템에서 상기 단말이 페이징 정보를 수신하는 방법에 있어서, 상기 단말이 일정 주기마다 상기 페이징 정보를 수신하고, 상기 페이징 정보에 포함된 페이징 지시자를 확인하는 과정과, 상기 페이징 지시자에 포함된 그룹 아이디가 상기 단말의 그룹 아이디와 동일한지를 확인하는 과정과, 상기 단말의 그룹 아이디와 동일하면, 상기 단말이 현재 위치한 주파수 대역을 확인하는 과정과, 상기 단말이 현재 위치한 주파수 대역이, 상기 단말의 최소 수신 대역폭으로 구분된 주파수 대역들 중 상기 페이징 정보 중 페이징 메시지가 전송되는 하나의 주파수 대역과 일치하면, 상기 페이징 메시지가 전송되는 주파수 대역을 통하여 상기 페이징 메시지를 수신 Also, according to an embodiment of the present invention, there is provided in a wireless communication system, an integral multiple of a minimum reception bandwidth of the system bandwidth terminal to a method in which the terminal receives the paging information, and the terminal receives the paging information every predetermined period, wherein If the process of checking the paging indicator included in the paging information, and the group ID included in the paging indicator equal to the group ID of the terminal process of the same check whether the group ID of the terminal, the frequency that the UE is currently located If the procedure to determine the bands, the terminal matches the current in the band is, one frequency band is a paging message of the paging information of the separated frequency bands to the minimum reception bandwidth of the mobile station is transmitted, the paging message receiving the paging message through the frequency band to be transmitted 는 과정과, 상기 단말이 현재 위치한 주파수 대역이 상기 페이징 메시지가 전송되는 하나의 주파수 대역과 일치하지 않으면, 주파수 대역을, 상기 페이징 메시지가 전송되는 하나의 주파수 대역으로 변경한 후 상기 페이징 메시지를 수신하는 과정과, 상기 페이징 메시지 내의 단말 아이디가 상기 단말의 아이디와 동일한지를 확인하고, 동일한 경우에 시스템으로부터 호출이 발생하였음을 인지하는 과정을 포함한다. The process and, after the terminal is if the current in the band not match the one frequency band in which the paging message transmission, the frequency band, changes in one frequency band in which the paging message transmission receives the paging message process, and the terminal ID in the paging message equal to ensure the identity of the terminal, and includes the step of recognizing a call from the system to the same case has occurred. 또한 본 발명의 실시예에 따르면, 시스템 대역폭이 단말의 최소 수신 대역폭의 정수배인 무선통신시스템에서 상기 단말에게 페이징 정보를 전송하는 장치에 있어서, 상기 페이징 정보에 대한 채널 부호화를 수행하는 채널 부호화기와, 상기 부호화된 페이징 정보 중 페이징 지시자를, 상기 단말의 최소 수신 대역폭으로 구분된 모든 주파수 대역들에 매핑하고, 상기 부호화 된 페이징 정보 중 페이징 메시지를 상기 주파수 대역들 중 하나의 주파수 대역에 매핑하는 매퍼와, 전송하고자 하는 상기 페이징 지시자와 상기 페이징 메시지를 상기 채널 부호화기로 전달하며, 상기 페이징 메시지가 매핑될 상기 하나의 주파수 대역을 지정하는 제어기와,상기 주파수 대역들에 각각 매핑된 상기 페이징 지시자와 상기 페이징 메시지를 시간 영역의 신호로 변환하 In addition, the channel coder, which, according to an embodiment of the present invention, there is provided in the system bandwidth, the terminal minimum reception bandwidth integral multiple of a radio communication system to the apparatus for transmitting paging information to the MS, performing channel coding for the paging information, the paging indicator of the encoded paging information, and a mapper to map to all frequency bands separated by a minimum reception bandwidth of the UE, and the mapping to one frequency band of said frequency band the paging message of the encoded paging information the paging indicator and the transfers a paging message to the channel encoder, the paging and the controller for designating the one frequency band to which the message is mapped, the frequency band of each mapping the paging indicator and the paging to the to be transmitted converting the message into a signal in the time domain and 여 전송하는 변환부를 포함한다. It comprises converting units transmitting over. 또한 본 발명의 실시예에 따르면, 시스템 대역폭이 단말의 최소 수신 대역폭의 정수배인 무선통신시스템에서 페이징 정보를 수신하는 장치에 있어서, 상기 단말의 최소 수신 대역폭과 동일한 크기로 구분된 복수의 주파수 대역들 중 소정 주파수 대역의 신호를 수신하는 수신부와,상기 수신된 신호로부터 페이징 지시자와 페이징 메시지를 추출하는 디매퍼와, 상기 추출된 페이징 지시자와 페이징 메시지를 각각 복호화하는 복호기와, 상기 페이징 메시지를 수신하도록 수신 주파수 대역을 조절하는 주파수 제어기와, 상기 단말이 현재 위치한 주파수 대역이 상기 페이징 메시지가 전송되는 하나의 주파수 대역과 일치하지 않으면, 주파수 대역을, 상기 페이징 메시지가 전송되는 하나의 주파수 대역으로 변경하도록 상기 주파수 제어기를 제어하는 수신 Furthermore, according to the embodiment of the invention, the system bandwidth is provided an apparatus for receiving paging information from the minimum reception bandwidth integer multiple of the radio communication system of the terminal, a plurality of frequencies separated by the same size as the minimum reception bandwidth of the terminal band one to receive and the receiver for receiving a signal in a predetermined frequency band, and a demapper for extracting a paging indicator and paging message from the received signal, a decoder for each decoding the extracted paging indicator and the paging message, the paging message and a frequency controller for controlling the reception frequency band, the terminal such that the current in the band changing one does not match the frequency band, the frequency band in which the paging message transmission, as a frequency band in which the paging message transfer received for controlling the frequency controller 제어기를 포함한다. And a controller. 이하 첨부된 도면을 참조하여 본 발명의 바람직한 실시예에 대한 동작 원리를 상세히 설명한다. Reference to the accompanying drawings will be described an operation principle of a preferred embodiment of the present invention; 하기에서 본 발명을 설명함에 있어 관련된 공지 기능 또는 구성에 대한 구체적인 설명이 본 발명의 요지를 불필요하게 흐릴 수 있다고 판단되는 경우에는 그 상세한 설명을 생략할 것이다. In the following description of the invention In the following a detailed description of known functions and configurations that are determined to unnecessarily obscure the subject matter of the present invention, a detailed description thereof will be omitted. 그리고 후술되는 용어들은 본 발명에서의 기능을 고려하여 정의된 용어들로서 이는 사용자, 운용자의 의도 또는 관례 등에 따라 달라질 수 있다. And as will be described later terms are terms defined in consideration of functions of the present invention may vary according to users, operator's intention or practice. 그러므로 그 정의는 본 명세서 전반에 걸친 내용을 토대로 내려져야 할 것이다. Therefore, the definition should be made based on the contents across the specification. 이하 본 발명을 구체적으로 설명하는데 있어서, OFDM 기반 시스템을 주된 대상으로 할 것이지만, 본 발명의 기본 목적인 페이징 정보의 송수신 과정은, 유사한 기술적 배경 및 채널 구조를 가지는 여타의 통신 시스템에도 본 발명의 범위를 크게 벗어나지 아니하는 범위에서 약간의 변형으로 적용 가능하며, 이는 본 발명의 분야에서 숙련된 기술적 지식을 가진 자의 판단으로 가능할 것이다. According to the presence of more than the present invention in detail, but to the OFDM-based systems, the main target, transmitting and receiving of basic purpose paging information of the present invention, even in other communication systems having similar technical background and channel structure of the scope of the invention available in a range of not significantly departing applied to slight variations, which will be at the discretion of a skilled person with knowledge in the technical field of the present invention. 본 발명에서는 상기 기술한 바와 같은 단말이 유휴 상태에서 페이징 정보를 수신하는 경우 확장성 대역폭을 지원하는 PCH(Paging Channel) 구조를 제안한다. In the present invention, if the terminal receives the paging information in an idle state as described above it proposes a PCH (Paging Channel) structures that support scalable bandwidth. 특히, 본 발명에서 제안하기는 기술은 PCH 오버헤드를 낮게 하면서 단말의 수신기 복잡도를 줄일 수 있게 된다. In particular, in the present invention is to propose technology is possible, while a low PCH overhead reduces the complexity of the UE receiver. 본 발명에서 제안하는 기술의 핵심은 PCH 신호에 포함되는 정보를 특성에 따라서 PI(Paging Indicator)와 페이징 메시지로 나누고, 확장성 대역폭을 지원하기 위해 상기 두 개의 정보를 주파수 영역에서 달리 매핑하는 것이다. The core of the technology proposed by the present invention is divided into PI (Paging Indicator) and the paging message according to the attribute information included in the PCH signal, to map, unlike the above two pieces of information to support scalable bandwidth in the frequency domain. 상술한 바와 같이 PI는 시스템이 호출하고자 하는 단말이 속한 그룹을 지시하는 그룹 ID와 페이징 메시지가 어떤 무선자원을 통해 전송되는지를 알려주는 스케쥴링 정보로 구성된다. PI as described above is composed of the scheduling information indicating whether the transmission system through the group ID and the paging message to any terminal to indicate the group that the wireless resources to the call. 상기 그룹 ID는 복수개의 단말 ID를 대표하는 ID이다. The group ID is an ID that represents the plurality of the terminal ID. 페이징 메시지는, 상기 PI가 알려주는 그룹 내에서 시스템이 호출하고자 하는 단말의 ID와, 어떤 목적으로 호출이 발생했는지 등의 정보로 구성된다. Paging message, informing that the PI is composed of information such that the called ID and a purpose of the terminal to be called, the system in the group occurs. 이하에서는 도 2 와 도 3을 참조하여 본 발명에서 제안하는 기술의 요지를 설명하고자 한다. Hereinafter reference to Figure 3 and Figure 2 will be described the subject matter of the technique proposed by the present invention. 도 2는 본 발명의 실시예에 따른 PCH 구성 방법을 도시한 것이다. Figure 2 illustrates a PCH configuration method according to an embodiment of the invention. 도 2에서는 전송 대역폭이 20MHz인 시스템에서 최소 대역폭이 10MHz인 단말에게 PCH 신호를 전송하는 경우를 가정한다. 2, it is assumed a case in which the transmission bandwidth is transmitted to the PCH signal is the minimum bandwidth of 10MHz in a terminal system of 20MHz. 도 2를 참조하면, 전체 20MHz 대역에서 편의상 좌측 10MHz 대역을 대역 A (200), 우측 10MHz 대역을 대역 B(202)라고 칭한다. Referring to Figure 2, for convenience referred to as the full 10MHz band left the band A (200) in the 20MHz band, band B (202) the right 10MHz band. 현재 단말(218)은 대역 B(202)에 위치하여 중심 RF 주파수를 대역 B(202)의 중심(208)으로 맞춰서 기지국(또는 Node B)으로부터 전송되는 신호를 수신하는 동작을 수행한다. Current terminal 218 performs an operation of receiving a signal transmitted from the base station (or Node B) to match the center RF frequency located in the band B (202) to the center 208 of the band B (202). 현재 단말(218)은 유휴 상태이며 일정 DRX 주기마다 유휴 상태에서 깨어나서 수신동작을 수행한다. Current terminal 218 is idle and performs the reception operation awakes from the idle state at the predetermined DRX cycle. 기지국은 최소 대역폭이 10MHz인 단말을 지원하기 위해, 상기 PI 정보를 대역 A(200)와 대역 B(202) 내에서 각각 중복해서 전송함으로써(210,212), 상기 10MHz 단말이 대역 A(200)와 대역 B(202)중 어느 대역에 위치하고 있더라도 상기 PI 정보(210 또는 212)를 수신할 수 있도록 한다. The base station by to assist the terminals to a minimum bandwidth 10MHz, by respectively overlapping the PI information in the band A (200) and a band B (202) transmitting (210 212), the 10MHz terminal band A (200) and the band B (202), even if located in one of the band makes it possible to receive the PI information (210 or 212). 그리고 페이징 메시지(214)는 사전에 시스템 정보를 통해 대역 A(200) 내에서 전송하기로 기지국과 단말간에 약속하여 대역 B(202)에서는 전송되지 않도록 함으로써 페이징 메시지 전송의 오버헤드를 최소화한다. And paging message 214 minimizes the overhead of the system by using the information in advance in transmitting in-band A (200) and agreed between the BS and the MS not to transmit in the band B (202) transmitting the paging message. 현재 대역 B(202)에 위치하고 있는 단말(218)은 유휴 상태에서 깨어나 기지국으로부터 PI 정보(212)를 수신하고 상기 PI 정보(212) 내의 그룹 ID가 자신의 그룹 ID와 동일한지 여부를 판단한다. UE 218 is located in the current band B (202) receives the PI information (212) waking up from the base station in an idle state, and determines whether the group ID in the PI information 212 is identical to the own group ID. 만약 상기 그룹 ID가 자신의 그룹 ID와 동일하지 않다면 단말(218)은 다시 유휴 상태를 유지하며, 동일하다면 추가적으로 페이징 메시지를 수신해야 함을 인지하고 PI 정보(212) 내에서 상기 페이징 메시지(214)의 스케쥴링 정보를 확인한다. If not, that the group ID is not identical to the own group ID terminal 218 is the paging message 214 in the back and maintaining the idle state, as long as they have the same recognize that need to receive additional paging messages and PI information 212 Check the scheduling information. PI 정보(212) 내에서 자신의 그룹 ID를 확인한 단말(218)은 사전 약속에 의해 페이징 메시지(214)가 대역 A(200) 내로 전송됨을 이미 알고 있으므로, 중심 RF 주파수를 대역 A의 중심(204)으로 전환하여 페이징 메시지(214)의 수신 동작을 수행한다. PI information 212, the center of the terminal 218 confirming their group ID in the so known that a paging message (214) by a predefined transmission into the zone A (200), the center RF frequency band A (204 ) to a conversion, it performs the reception operation of the paging message (214). 이때 상기 중심 RF 주파수 변경에 수반되는 시간지연을 보상하기 위해 대역 B(202) 내로 전송되는 PI(212)는 대역 A(200) 내로 전송되는 PI(210)보다 일정 시간 앞서 전송되도록 설정할 수 있으며, 따라서 결과적으로 대역 A(200)의 페이징 메시지(214)를 수신함에 있어서 시간 지연 문제가 발생하지 않도록 할 수 있다. In this case, the center in order to compensate for the time delay associated with RF frequency changing PI (212) that is transmitted into the zone B (202) can be set to be transmitted before a predetermined time than the PI (210) that is transmitted into the zone A (200), Therefore, it is possible to prevent a time delay as a result no problem occurs in the paging message 214 in band a (200) to receiving. 상기와 같이 중심 RF 주파수를 변경한 단말(216)은 상기 PI 정보 내의 페이징 메시지에 대한 스케줄링 정보로부터 페이징 메시지(214)가 어떤 무선자원을 통해 전송되는지 알 수 있다. Terminal 216, which changes the RF center frequency as described above is a paging message (214) from the scheduling information for the paging message in the PI information, it can be seen that it is delivered via any radio resource. 또한 단말(216)은 수신한 페이징 메시지(214) 내의 단말 ID와 자신의 단말 ID가 동일한지 여부를 확인한다. In addition, terminal 216 is the terminal ID and the own terminal ID in the received paging message 214 determines whether the same. 만약 상기 페이징 메시지(214) 내의 단말 ID가 자신의 단말 ID와 동일하지 않다면 단말(216)은 유휴 상태로 전환하고, 동일하다면 단말(216)은 시스템으로부터 자신한테 호출이 발생했음을 인지하고 어떤 목적의 호출인지 등의 정보를 획득함으로써 페이징 절차를 종료한다. If it recognized that the paging message, if not identical to the own terminal ID is the terminal ID in the 214, the terminal 216, if idle, and the same terminal 216 is a call to yourself from a system and for any purpose, by obtaining information such as whether the call terminates the paging procedure. 도 3은 본 발명의 다른 실시예에 따른 페이징 채널을 구성하는 방법을 도시한 것이다. Figure 3 illustrates a method of configuring a paging channel according to another embodiment of the present invention. 도 3에서는 전송 대역폭이 20MHz인 시스템에서 최소 대역폭이 10MHz인 단말이 10㎒ 대역에 있는 경우를 가정한다. 3, it is assumed a case in which the system is 20MHz transmission bandwidth is a minimum bandwidth of 10MHz in the terminal 10㎒ band. 도 3을 참조하면, 도 2의 경우처럼 기지국은 최소 대역폭이 10MHz인 단말을 지원하기 위해, 상기 PI 도 2의 경우처럼 기지국은 최소 대역폭이 10MHz인 단말을 지원하기 위해, 상기 PI 정보를 대역 A(300)와 대역 B(302) 내에 각각 중복해서 전송하고, 페이징 메시지는 사전에 시스템 정보를 통해 대역 A(300) 내로 전송하기로 약속한다. In the case of FIG. 3, the Figure 2, as the base station to support the minimum bandwidth 10MHz terminal, the PI is also, as in the case of the second base station to assist the terminals to a minimum bandwidth 10MHz, band A to the PI information, each redundantly transmitted in 300 with the band B (302), and a paging message is committed by the system information prior to transmission into a band a 300. 상기 PI와 페이징 메시지에 각각 단말(316)의 그룹 ID와 단말 ID가 포함되어 있다고 가정한다. It is assumed that includes the group ID and the terminal ID of the terminal 316 respectively, in the PI and the paging message. 현재 대역 A(300)에 위치하고 있는 단말(316)이 유휴 상태에서 깨어나 기지국으로부터 PI 정보(310)를 수신하고 상기 PI 정보(310) 내의 그룹 ID가 자신의 그룹 ID와 동일한지 여부를 판단한다. Receiving the current band A (300) terminal (316) PI information 310 from the base station to wake up from an idle state is located in, and determines whether the group ID in the PI information 310 is identical to the own group ID. 상기 그룹 ID가 자신의 그룹 ID와 동일하면 단말(316)은 추가적으로 페이징 메시지(314)를 수신해야 함을 인지하고, PI 정보(310) 내에서 상기 페이징 메시지(314)의 스케쥴링 정보를 확인한다. If the group ID same as its group ID, the terminal 316 confirms the scheduling information of the paging message 314 in the additional paging message recognize that need to receive (314), and PI information (310). 또한 PI 정보(310) 내에서 자신의 그룹 ID를 확인한 단말(316)은 사전 약속에 의해 페이징 메시지(314)가 대역 A(300) 내로 전송됨을 이미 알고 있으므로, 현재의 중심 RF 주파수를 그대로 유지한 채 페이징 메시지(314)의 수신 동작을 수행한다. In addition, PI information 310, the terminal 316 confirming their group ID in the so a paging message (314) by a predefined transmission that are already known within the band A (300), which keep the current center RF frequency of the while performs the reception operation of the paging message (314). 단말은 상기 PI 정보(310) 내의 페이징 메시지(314)에 대한 스케줄링 정보로부터 페이징 메시지(314)가 어떤 무선자원을 통해 전송되는지 알 수 있다. The UE can know that the paging message (314) from the scheduling information about the paging message 314 in the PI information (310) transmitted on a certain radio resource. 페이징 메시지(314)를 수신한 단말(316)은 페이징 메시지(314) 내의 단말 ID와 자신의 단말 ID가 동일한지를 확인하며, 동일하면 자신한테 시스템으로부터 호출이 발생했음을 인지하고 어떤 목적의 호출인지 등의 정보를 획득함으로써 페이징 절차를 종료한다. Receiving a paging message 314, the terminal 316 is the paging message 314 in the terminal ID and and its own terminal ID that make the same paper, the same if the like whether it is that a call from the system occurs to yourself and calls for any purpose by obtaining the information, and ends the paging procedure. 상기 기술한 본 발명의 실시예에 따른 대역 확장성을 지원하는 페이징 채널의 구조 및 절차를 요약하면 다음과 같다. In summary, the structure and procedures of the paging channel to support scalable bandwidth according to an embodiment of the above-described present invention. 첫째, 사전 정의에 의해 페이징 메시지가 전송되는 대역을 지정한다. First, it specifies the bands paging message is transmitted by the pre-defined. 둘째, PI 정보는 단말의 최소 대역폭에 따른 대역마다 중복하여 전송한다. Second, PI information is transmitted in duplicate for each band according to the minimum bandwidth of the terminal. 셋째, 상기 페이징 메시지가 전송되는 대역 이외의 대역에서 전송되는 PI 정보는 페이징 메시지가 전송되는 대역에서 전송되는 PI 정보보다 일정 타이밍 오프셋을 두고 먼저 전송한다. Third, PI information transmitted in a band other than the band in which the paging message is transmitted with a certain timing offset than the PI information being transmitted in a band that is a paging message is transmitted and transmits first. 이와 같이 본 발명에서 제안하는 기술을 통해 페이징 메시지의 전송 오버헤드를 줄일 수 있고, 상기 도 3에서 단말(316)은 중심 RF 주파수를 변경할 필요가 없으므로, 단말로 하여금 중심 RF 주파수의 변경을 최소화하여 단말의 수신 복잡도를 줄이는 효과가 있다. In this manner it is possible through a technique proposed by the present invention to reduce the transmission overhead of a paging message, at the 3 terminal 316 that there is no need to change the center RF frequency, to allow the terminal to minimize the change of the center RF frequency It has the effect of reducing the reception complexity of the terminal. 하기에서 구체적인 실시예와 함께 본 발명에서 제안하는 기술을 상세히 설명한다. To be described in detail a technique proposed by the present invention with specific examples from. 본 발명의 실시예에서는 시스템 대역폭은 20MHz이고, 시스템 대역 내에 허용되는 단말의 최소 수신 대역폭은 10 MHz으로 가정하여 설명한다. In an embodiment of the present invention, the system bandwidth is 20MHz, and the minimum reception bandwidth of the terminal to be accepted in the system band is described assuming a 10 MHz. 도 4는 본 발명의 실시예에 따른 기지국의 페이징 정보 송신 절차를 나타낸것이다. Figure 4 illustrates the transmission process the paging information of the base station according to an embodiment of the invention. 도 4를 참조하면, 기지국은 페이징 정보를 송신하기에 앞서 400 단계에서 사전에 시스템 정보를 통해 페이징 메시지가 전송되는 대역을 지정하여 단말에게 알려준다. 4, the base station informs the terminal to specify a band that is a paging message is transmitted on the system information in advance in step 400 prior to transmitting the paging information. 이하 설명의 편의를 위해 상기 페이징 메시지가 전송되는 대역을 '대역 A'라 하고, 그 이외의 대역을 '대역 B'라고 일컫는다. Referred to the band from which the paging message is transmitted for the convenience of the following description, "band A", and refers to the band of the other as "Band B". 상기 시스템 정보는 BCH를 통해 전송될 수 있다. The system information may be sent on the BCH. 또는 상기 대역 A는 사전 약속에 의해 고정시킬 수도 있다. Or the A-band may be fixed by the appointment. 402 단계에서 기지국은 페이징 정보를 전송하기 위하여 전송 대역을 대역 A와 대역 B로 구분한다. In step 402, the base station divides the transmission band to the band A and band B for transmitting the paging information. 기지국은, 대역 A로 페이징 정보를 전송할 경우에는 404 단계에서 PI 정보 및 페이징 메시지를 포함하는 페이징 정보를 전송하며, 대역 B로 페이징 정보를 전송할 경우에는 406 단계에서 페이징 메시지를 제외한 PI 정보를 포함하는 페이징 정보를 전송한다. The base station, for transferring paging information in-band A, and transmits the paging information including PI information and paging message in step 404, when transferring the paging information to the band B containing the PI information other than the paging message in step 406 and transmits the paging information. 이때 대역 B 내에 전송되는 PI는 대역 A 내에 전송되는 PI보다 사전 정의된 타이밍 오프셋만큼 먼저 전송되도록 함으로써 상술한 중심 RF 주파수 변경에 소요되는 시간 지연을 보상한다. The PI is transmitted in a band B is to compensate for the time delay required for the above-described RF center frequency by changing such as the first transmission timing offset than the pre-defined PI transmitted in the band A. 상기 타이밍 오프셋은 사전 약속에 의해 고정시키거나, 또는 시스템 정보를 통해 단말한테 알려주어 단말로 하여금 페이징 메시지의 수신 타이밍을 조절하도록 할 수 있다. The timing offset may be given to stabilize by appointment, or tell me terminal through system information allows the terminal to control the reception timing of the paging message. 상기 대역 A와 대역 B 내로 전송되는 PI는, 동일한 정보를 포함할 수도 있고 동일하지 않은 정보를 포함할 수도 있다. PI is sent into the band A and band B, it may include the same information and may comprise a non-identical information. 상기 대역 A와 대역 B 내로 전송되는 PI가 동일한 정보를 포함할 경우에는, 단말의 수신 입장에서는 PI의 전송 포맷이 일정하므로 수신기의 복잡도를 줄일 수 있다. If the PI is sent into the band A and the band B containing the same information, in the receiving position of the terminal, because the transmission format of PI constant can reduce the complexity of the receiver. 또한 대역 B의 단말은 이미 페이징 메시지가 대역 A로 전송됨을 알고 있으므로 상기 PI로부터 페이징 메시지에 대한 스케쥴링 정보를 수신하면 이를 대역 A를 기준으로 해석한다. Furthermore, the terminal of the band B, so that the already known paging message is sent to the band A is interpreted relative to the band A when it receives the scheduling information for the paging message from the PI. PI가 동일한 정보를 포함할 경우, PI는 그룹 ID와 페이징 메시지에 대한 스케쥴링 정보를 포함할 수도 있고, 그룹 ID와 스케줄링 정보에 더하여 페이징 메시지가 전송되는 주파수 대역 정보도 포함할 수 있다. If the PI is contained the same information, PI may also include frequency band information to the group ID and may include the scheduling information for the paging message, the paging message in addition to the group ID and the scheduling information transmission. 이 경우에는 시스템 정보를 통해 페이징 메시지가 전송되는 주파수 대역을 알려주지 않아도 되므로 좀더 유연한(flexible) 무선자원 관리가 가능하다. In this case, it is possible to more flexible (flexible) radio resource management, so do not give the band which paging messages are transmitted via the system information. 또한, 페이징 메시지가 전송되는 주파수 대역을 한쪽으로만 고정시킴으로 인해 발생할 수 있는 과부하를 퍼뜨려주는 효과를 기대할 수 있다. In addition, it sikimeuro fixed frequency band which paging messages are transmitted in only one can be expected to spread to the effect that overloading may occur. 즉, 페이징 메시지는 단말에 따라 대역 A와 대역 B 내로 모두 전송될 수 있다. That is, the paging message may be sent into both band A and band B in accordance with the terminal. 단말은 PI 내에 포함된 페이징 메시지의 전송 대역을 나타내는 지시자를 확인함으로써 페이징 메시지가 어느 대역으로 전송되는지 알 수 있다. The UE can know that the paging message is transmitted in a certain band by confirming the indicator indicating the transmission bandwidth of the paging message included in the PI. 도 5는 본 발명의 실시예에 따른 단말의 페이징 정보 수신 절차를 나타낸 것이다. Figure 5 shows the procedure of a terminal receiving the paging information in accordance with an embodiment of the present invention. 도 5를 참조하면, 500 단계에서 단말은 시스템 정보를 통해 페이징 메시지가 전송되는 대역(대역 A)을 인지한다. 5, in step 500, the UE recognizes the band (band A) for paging messages are transmitted on the system information. 현재 단말은 유휴 상태로서 DRX 주기마다 유휴 상태에서 깨어나 페이징 정보를 수신한다. Current terminal receives the paging information wake up from the idle state per DRX cycle as idle. 502 단계에서 단말은 수신한 페이징 정보 중에서 PI를 확인하고, 504 단계에서 PI 내의 그룹 ID가 자신의 그룹 ID와 동일한지 여부를 확인한다. In step 502, the terminal checks the PI from the received paging information, and confirms whether the group ID in the same PI and his group ID at step 504. 만약 상기 두 개의 그룹 ID가 동일하지 않다면, 단말은 516 단계로 진행하여 다시 유휴 상태로 상태를 변경하고 페이징 절차를 종료한다. If not, the two are not the same group ID, the UE changes the state to an idle state again, the process proceeds to step 516 and ends the paging procedure. 만약 상기 두 개의 그룹 ID가 동일하다면, 단말은 506 단계로 진행하여 자신이 대역 A에 있는지 대역 B에 있는지를 확인하고, 확인 결과에 따라 이에 상응하는 페이징 동작을 취한다. If the two are identical a group ID, the UE shall take proceeds to step 506 to determine if they are in that band in the band A and B, according to the check result of a paging operation corresponding thereto. 즉, 대역 A에 있는 단말은 508 단계로 진행하여 상기 PI에 포함된 페이징 메시지에 대한 스케쥴링 정보를 이용하여 대역 A에서 페이징 메시지를 수신한다. In other words, the terminal in the band A by using the scheduling information for the control proceeds to step 508 a paging message included in the PI receives a paging message in band A. 510 단계에서 단말은 상기 페이징 메시지에 포함된 단말 ID와 자신의 단말 ID가 일치하는지 여부를 확인하여, 일치하면 시스템으로부터 호출이 발생했음을 알고 517 단계에서 추가적으로 어떠한 목적의 호출인지 등의 정보를 확인한 후 페이징 절차를 종료한다. Then in step 510 the UE check information such as whether the terminal ID and the own terminal ID is to determine whether it matches, the matches are to know that a call from the system, generating a call to any purpose in addition in 517 steps included in the paging message to end the paging procedure. 만약 상기 두 개의 단말 ID가 일치하지 않으면 단말은 516 단계로 진행하여 유휴 상태로 상태를 변경하고 페이징 절차를 종료한다. And if the two terminals if the ID does not match, the MS proceeds to step 516 to change the state to the idle state and terminate the paging process. 또한 상기 506 단계에서 확인한 결과 단말이 대역 B에 있을 경우, 단말은 512 단계로 진행하여 중심 RF 주파수를 대역 A의 중심 RF 주파수로 변경한다. Also, if the result of the terminal identified in the step 506 to the band B, the UE proceeds to step 512 and changes the RF center frequency to the center frequency of the RF bands A. 이후 단말은 514 단계에서 상기 PI 내의 페이징 메시지에 대한 스케쥴링 정보를 이용하여 대역 A로부터 페이징 메시지를 수신한다. Since the terminal in step 514 using the scheduling information for the paging message in the PI receives a paging message from the A-band. 그리고 단말은 510 단계에서 상기 페이징 메시지에 포함된 단말 ID와 자신의 단말 ID가 일치하는지 여부를 확인하여, 일치하면 510 단계로 진행하여 시스템으로부터 호출이 발생했음을 알고, 517 단계에서 추가적으로 어떠한 목적의 호출인지 등의 정보를 확인한 후 페이징 절차를 종료한다. And the UE when to check whether the terminal ID and the own terminal ID included in the paging message match, the match in the step 510 proceeds to step 510 to know that the generated calls from the system, calling for any purpose in addition in the 517 step after verifying the information, such as whether to end the paging procedure. 만약 상기 두 개의 단말 ID가 일치하지 않으면, 단말은 516 단계로 진행하여 유휴 상태로 상태를 변경하고 페이징 절차를 종료한다. If the two do not match, the terminal ID, the terminal proceeds to step 516 to change the state to idle, and ends the paging procedure. 상기 단말의 DRX 주기에 대하여, 대역 B의 단말은 대역 A의 단말보다 사전에 정의된 타이밍 오프셋만큼 먼저 유휴 상태에서 깨어나도록 설정함으로써 대역 A의 PI보다 일정 타이밍 오프셋만큼 먼저 전송되는 대역 B의 PI를 제때에 수신할 수 있도록 한다. With respect to the DRX period of the UE, the bandwidth B of the terminal is the PI of band that is transmitted by a predetermined timing offset than the PI of band A, by setting so as first to wake from idle, the timing offset is defined in advance than the band A terminal first, B so that you can receive in a timely manner. 상기 타이밍 오프셋은 시스템 정보를 통해 단말에게 알려줄 수 있다. The timing offset may be notified to the UE through the system information. 도 6은 본 발명의 실시예에 따른 기지국의 페이징 정보 전송 장치의 구성을 나타낸 것이다. Figure 6 shows the structure of the paging information transmission device of the base station according to an embodiment of the invention. 도 6을 참조하면, PI 채널 부호화기(600)와 페이징 메시지 채널 부호화기(602)은 각각 PI와 페이징 메시지에 대한 채널코딩을 수행한다. Referring to Figure 6, PI channel encoder 600 and the paging message channel encoder 602 performs channel coding for each of the PI and the paging message. 예를 들어 '대역 A'의 경우, PI와 페이징 메시지를 함께 채널코딩하고 '대역 B'의 경우, PI만을 채널코딩할 수도 있다. For example, in "band A", with the PI and the paging message channel coding and "band B" For, it is also possible to only the channel coding PI. PI 채널 부호화기(600)와 페이징 메시지 채널 부호화기(602)에서 생성된 코드 심벌들은 부반송파 심벌매퍼(604)에 의해 해당하는 페이징 정보 전송을 위한 주파수 대역으로 매핑되고, IFFT(Inverse Fast Fourier Transformer) 블록(608)을 거친 후 시간 영역의 OFDM 신호(610)로 생성된다. PI channel encoder 600 and the paging message channel encoded symbols generated by the encoder 602 are mapped to the frequency band for the paging information transmitted to the by the subcarrier symbol mapper (604), IFFT (Inverse Fast Fourier Transformer) block ( after a 608) it is generated by the OFDM signal 610 in the time domain. 이때 시스템 대역폭이 20 MHz 인 경우에는, PI의 부반송파 심벌들은 양쪽 10 MHz 대역에 해당하는 IFFT 입력 탭들로 각각 매핑되며, 페이징 메시지의 부반송파 심벌들은 두 개의 10MHz 대역 중 어느 한쪽의 10 MHz 대역(대역 A)에 해당하는 IFFT 입력 탭들로 매핑된다. The system, if the bandwidth is 20 MHz, PI of the sub-carrier symbols are 10 MHz band of any of both 10 MHz are respectively mapped to IFFT input tabs corresponding to the band, the subcarrier symbols of the paging message are two 10MHz band one (band A ) it is mapped to IFFT input tabs corresponding to. 상기의 매핑 동작은 제어기(606)의 제어에 의하여 이루어진다. The mapping operation is made by the control of the controller 606. 즉, 제어기(606)는 상기 전송하고자 PI 및 페이징 메시지를 각각 PI 채널부호화기(600)와 페이징 메시지 채널 부호화기(602)로 제공하며, 또한 시스템 대역폭에 따른 상기 페이징 정보 부반송파 심벌들의 매핑 위치를 결정하고 상기 결정에 따라 부반송파 심벌 매퍼(604)를 제어한다. That is, the controller 606 provides to the PI channel encoder 600 and the paging message channel encoder 602, respectively, the PI and the paging message to the transmission, and determining a map location of the paging information subcarrier symbols according to the system bandwidth, and it controls the subcarrier symbol mapper 604 according to the determination. 도 7은 본 발명의 실시예에 따른 단말의 페이징 정보 수신 장치의 구성을 나타낸 것이다. 7 shows the configuration of a paging information reception apparatus of a terminal according to an embodiment of the present invention. 도 7을 참조하면, RF/IF 수신부(700)는 RF/IF 제어기(710)의 제어에 따라 수신 대역폭 및 수신 RF 주파수를 조정하여 원하는 대역의 신호를 수신한다. Referring to Figure 7, RF / IF receiving unit 700 receives a signal of the desired band by adjusting the reception bandwidth and the reception RF frequency according to the control of the RF / IF controller 710. FFT(Fast Fourier Transform) 블록(702)은 상기 수신된 신호를 변환하여 부반송파 심벌들로 출력하고, 부반송파 심벌 디매퍼(704)는 상기 수신 대역에서의 PI 및 페이징 메시지 심벌의 매핑 규칙에 따라서 상기 부반송파 심벌들 중 상기 정보들의 부반송파 심벌들을 선별하여 출력한다. FFT (Fast Fourier Transform) block 702 is the conversion of the received signal to output to the sub-carrier symbols, sub-carrier symbol demapper 704 is the sub-carrier according to the mapping rule of a PI and a paging message symbols in the received band of the symbol, and it outputs the selected sub-carrier symbols of the information. 수신 제어기(712)는 상기 시스템 대역폭 및 상기 페이징 정보들의 수신 타이밍에 따라서 RF/IF 제어기(710)를 제어한다. The reception controller 712 controls the RF / IF controller 710 in accordance with the reception timing of the system bandwidth and the paging information. 또한 상기 수신 제어기(712)는 부반송파 심벌 디매퍼(704)에서 출력되는 부반송파 심벌들이 PI 복호기(706)와 페이징 메시지 복호기(708)로 적절하게 입력되도록 제어하며, 상기 입력된 부반송파 심벌들이 각 복호기(706,708)에서 해당 정보에 적용된 채널코딩 포맷으로 복호되도록 PI 복호기(706)와 페이징 메시지 복호기(708)를 제어한다. In addition, the reception controller 712 is controlled so as to be properly input to the sub-carrier symbols are PI decoder 706 and a paging message decoder 708, output from the sub-carrier symbol demapper 704, and the input sub-carrier symbols to each decoder ( 706 708) decodes the channel coding format applied in the information to control the PI decoder 706 and a paging message decoder 708, in. 상기 PI 복호기(706)와 페이징 메시지 복호기(708)는 입력된 부반송파 심벌들을 복호하여 상기 페이징 정보들을 획득한다. The PI decoder 706 and a paging message decoder 708 to obtain the paging information to decode the input sub-carrier symbol. 이상에서 상세히 설명한 바와 같이 동작하는 본 발명에 있어서, 개시되는 발명 중 대표적인 것에 의하여 얻어지는 효과를 간단히 설명하면 다음과 같다. In the present invention which operates as described in detail above, it will be briefly described the effect obtained by certain exemplary invention disclosed as follows. 본 발명은 확장성 대역폭을 지원하는 셀룰러 무선통신 시스템에서 시스템 대역폭보다 작은 수신 대역폭을 가진 단말이 유휴 상태에서 깨어나 페이징 정보를 수신하는 경우, 단말의 수신 복잡도와 기지국의 페이징 정보 전송의 오버헤드를 줄일 수 있다. The present invention is scalable, if in a cellular wireless communication system that supports a bandwidth with a small reception bandwidth than the system bandwidth, the terminal receives the paging information wake from idle, reducing the overhead of the paging information transmitted in the reception of the UE complexity, as a base station can. 상기 주파수 대역들 중 하나의 주파수 대역으로 상기 시스템이 호출하고자 하는 단말의 아이디를 포함하는 페이징 메시지를 전송하는 과정을 포함하는 페이징 정보 전송 방법. In one frequency band of said frequency band the paging information transmission method comprising the step of transmitting a paging message including an ID of the terminal to call the system. 상기 주파수 대역들 중 상기 페이징 메시지를 전송할 상기 하나의 주파수 대역을 선택하여 시스템 정보를 통해 상기 단말에게 알리는 과정을 더 포함하는 페이징 정보 전송 방법. Paging information transmission method of one of the frequency bands to transmit the paging message over the system information to select the one of the frequency bands further includes the step to let the user terminal. 상기 주파수 대역들 중 상기 페이징 메시지가 전송되는 상기 하나의 주파수 대역에 관한 정보를 더 포함하는 페이징 정보 전송 방법. One of said frequency band the paging information transmission method further comprises the information about the one frequency band in which the paging message is sent. 상기 하나의 주파수 대역 이외의 주파수 대역들로 전송하는 페이징 지시자는, 상기 하나의 주파수 대역으로 전송하는 페이징 지시자보다 미리 정해진 타이밍 오프셋만큼 앞선 시점에 전송하는 페이징 정보 전송 방법. Paging indicators transmitted in a frequency band other than the one frequency band, a paging information transmission method for transmitting to the preceding time by a predetermined timing offset than the paging indicator for transmitting to said one frequency band. 상기 페이징 지시자는, 상기 페이징 메시지에 대한 스케줄링 정보를 더 포함하는 페이징 정보 전송 방법. The paging indicator, the paging information transmission method further comprising the scheduling information for the paging message. 상기 페이징 메시지 내의 단말 아이디가 상기 단말의 아이디와 동일한지를 확인하고, 동일한 경우에 시스템으로부터 호출이 발생하였음을 인지하는 과정을 포함하는 페이징 정보 수신 방법. Paging information reception method including a process to recognize the terminal ID in the paging message hayeoteum the same ensure the identity and calls from the system to the same case occurs in the terminal. 상기 주파수 대역들 중 상기 페이징 메시지가 전송되는 하나의 주파수 대역에 관한 정보를 시스템 정보를 통해 수신하는 과정을 더 포함하는 페이징 정보 수신 방법. Paging information reception method further comprising the step of: receiving information from system information relating to one frequency band of said frequency band to which the paging message is sent. 상기 주파수 대역들 중 상기 페이징 메시지가 전송되는 하나의 주파수 대역에 관한 정보를 더 포함하는 페이징 정보 수신 방법. Method received paging information further includes information about the one frequency band in which the paging message is sent among the frequency bands. 상기 페이징 메시지가 전송되는 하나의 주파수 대역 이외의 주파수 대역들로 전송되는 페이징 지시자는, 상기 하나의 주파수 대역으로 전송하는 페이징 지시자보다 미리 정해진 타이밍 오프셋만큼 앞선 시점에 전송하는 페이징 정보 수신 방법. The paging message is a paging indicator is transmitted in a frequency band other than a frequency band to be transmitted, the method receives the paging information transmitted in the previous time by a predetermined timing offset than the paging indicator for transmitting to said one frequency band. 상기 페이징 지시자는, 상기 페이징 메시지에 대한 스케줄링 정보를 더 포함하는 페이징 정보 수신 방법. The paging indicator, the paging information reception method further includes scheduling information about the paging message. 전송하고자 하는 상기 페이징 지시자와 상기 페이징 메시지를 상기 채널 부호화기로 전달하며, 상기 페이징 메시지가 매핑될 상기 하나의 주파수 대역을 지정하는 제어기와,상기 주파수 대역들에 각각 매핑된 상기 페이징 지시자와 상기 페이징 메시지를 시간 영역의 신호로 변환하여 전송하는 변환부를 포함하는 페이징 정보 전송 장치. The paging indicator and the transfers a paging message to the channel encoder, the paging and the controller for designating the one frequency band to which the message is mapped, the frequency band of each mapping the paging indicator and the paging message to the to be transmitted the conversion paging information transmission apparatus including a transmitting converted to time domain signals. 시스템 정보를 통하여 상기 페이징 메시지를 전송할 하나의 주파수 대역을 상기 단말에게 알려주는 페이징 정보 전송 장치. Send the paging message indicating the one frequency band to the UE through the system information, paging information transmission device. 상기 주파수 대역들 중 상기 페이징 메시지가 전송되는 상기 하나의 주파수 대역에 관한 정보를, 상기 페이징 지시자에 포함시켜서 상기 단말에게 전송하도록 상기 채널 부호화기를 제어하는 페이징 정보 전송 장치. By including the paging indicator in the paging information transmission device for controlling said channel coder to be sent to the UE the information about the one frequency band in which the paging message is sent among the frequency bands. 상기 변환부는, 상기 하나의 주파수 대역 이외의 주파수 대역들로 전송하는 페이징 지시자를, 상기 하나의 주파수 대역으로 전송하는 페이징 지시자보다 미리 정해진 타이밍 오프셋만큼 앞선 시점에 전송하는 페이징 정보 전송 장치. The conversion unit comprises a paging information transmission device for transmitting the paging indicators transmitted in a frequency band other than the one frequency band, the earlier time point by a predetermined timing offset than the paging indicator for transmitting to said one frequency band. 상기 페이징 지시자는, 상기 페이징 메시지에 대한 스케줄링 정보를 더 포함하는 페이징 정보 전송 장치. The paging indicator, the paging information transmission apparatus further comprising: a scheduling information for the paging message. 상기 단말이 현재 위치한 주파수 대역이 상기 페이징 메시지가 전송되는 하나의 주파수 대역과 일치하지 않으면, 주파수 대역을, 상기 페이징 메시지가 전송되는 하나의 주파수 대역으로 변경하도록 상기 주파수 제어기를 제어하는 수신 제어기를 포함하는 페이징 정보 수신 장치. A reception controller for controlling the frequency control the terminal such that the current in the band changing one does not match the frequency band, the frequency band in which the paging message transmission, as a frequency band in which the paging message transfer paging information receiving apparatus. 상기 수신 제어기는, 상기 페이징 지시자에 포함된 그룹 아이디와 단말의 그룹 아이디를 비교하여 동일한 경우에 상기 단말이 현재 위치한 주파수 대역을 확인하는 페이징 정보 수신 장치. The reception controller, a paging information receiving apparatus to determine the mobile station is currently located if the same frequency band as compared to the group ID of the group ID and the UE included in the paging indicator. 상기 수신부는, 상기 주파수 대역들 중 상기 페이징 메시지가 전송되는 하나의 주파수 대역에 관한 정보를 시스템 정보를 통해 수신하는 페이징 정보 수신 장치. The receiver, the paging information receiving apparatus for receiving system information via the information about the one frequency band of said frequency band to which the paging message is sent. 상기 주파수 대역들 중 상기 페이징 메시지가 전송되는 하나의 주파수 대역에 관한 정보를 더 포함하는 페이징 정보 수신 장치. Paging information receiving apparatus further includes information about the one frequency band in which the paging message is sent among the frequency bands. 상기 페이징 메시지가 전송되는 하나의 주파수 대역 이외의 주파수 대역들로 전송되는 페이징 지시자를, 상기 하나의 주파수 대역으로 전송하는 페이징 지시자보다 미리 정해진 타이밍 오프셋만큼 앞선 시점에 수신하도록 수신 타이밍을 조절하는 페이징 정보 수신 장치. Paging information for adjusting the reception timing for receiving a paging indicator is transmitted in a frequency band other than a frequency band in which the paging message transmission, the earlier time point by a predetermined timing offset than the paging indicator for transmitting to said one frequency band. receiving apparatus. 상기 페이징 지시자는, 상기 페이징 메시지에 대한 스케줄링 정보를 더 포함하는 페이징 정보 수신 장치. The paging indicator, the paging information receiving apparatus further comprises a scheduling information for the paging message.